Point-of-sale (POS) terminals are used for making payments, printing bills, inventory management, and carrying out loyalty programs across various end-use verticals such as retail, hospitality, and entertainment. POS terminals are increasingly seeing growth in demand as these products enable ease of making payment and offer low total cost of ownership (TCO). The global POS terminals market was valued at USD 7.99 billion in 2016 and is expected to expand at a CAGR of 12.9%. Moreover, by 2026, the global point-of-sale installed base is expected to reach 758.6 million units, at a CAGR of 19.6% over the forecast period 2018 – 2026. The high adoption of POS terminals across the retail, hospitality, healthcare, and warehouse / distribution industry is driven by ease of use and high return on investment. Types of POS terminals include fixed POS terminals, and wireless and mobile POS terminals. Mobile POS (mPOS) offers many advantages over fixed POS such as low cost and enhanced mobility. Further, it offers ease of use, as any mobile or tablet can be converted into mobile POS by simply attaching a reader with it. Thus, mPOS terminals are expected to experience high growth in demand over the coming years. Components of POS systems include hardware and software. POS applications include use of POS terminals in restaurant, hospitality, grocery/supermarket, hospitality-lodging, healthcare, retail, warehouse/distribution, field service, and government. Retail industry is expected to be thesignificant demand creator for POS throughout the research study during 2016 - 2026. Fast bill processing, maintaining customer database, data backup, inventory management, offering special discounts, and managing loyalty programs of retail stores are some of the major functions carried out by POS terminal systems. In recent years, various advancements in POS terminal systems such as adoption of real time analytics features are being observed and are leading to the growth of the overall POS terminals market. Adoption of POS terminals across the healthcare industry along with their growing use in warehouse management is expected to drive the market in future. In 2016, North America was the largest market for POS terminals in terms of revenue and in terms of POS installed base as well. The region has experienced significant adoption of POS terminals across various industries such as retail and entertainment. Continuous demand for POS solutions across countries such as Canada and the U.S. is attributed to significant growth of retail stores, and quick service restaurants and casinos in the region. In Europe, compliance requirements such as EuroPay, MasterCard, and Visa (EMV) regulations are driving the growth of the POS terminals market as these have enhanced the security of payments. Germany, France, and the U.K are experiencing significant growth in the POS terminals market for healthcare applications due to significant investment in technology to upgrade healthcare facilities in these countries. The market in Asia Pacific is expected to be the fastest growing due to expanding retail and hospitality sectors in China and India. Demand from countries such as Japan, China, India, Hong Kong, and Australia is expected to drive the Asia Pacific market in the coming years. Increasing demand for mobile POS from small and medium size businesses is expected to further drive the growth of the POS terminals market in Rest of the World (RoW) region. Walmart and other big retail chains are expanding their business in Latin America and this has led to growing demand for POS solutions in the region. The global POS terminals market is fragmented with intense competition among players.Key players in the POS terminals market include Ingenico S.A., NEC Corporation, PAX Technology Limited, MICROS Systems Inc., VeriFone Systems Inc., Cisco Systems Inc., Hewlett-Packard Company, Toshiba Corporation, Panasonic Corporation, and Samsung Electronics Co. Ltd. The point-of-sale (POS) terminals market has gained significant momentum in recent years due to the ease of use and improved return on investment being offered by these systems. POS terminals have a wide range of applications including payments, printing bills, inventory management, and carrying out loyalty programs across various end-use verticals such as retail, hospitality, and entertainment. Advanced POS systems offer higher reliability and durability as compared to traditional systems such as cash registers. The higher reliability of modern POS systems leads to significant reduction in total cost of ownership (TCO) and this in turn is aiding the growth in demand for POS solutions in small and medium size businesses. Mobile POS (mPOS) terminals have emerged as a contender to replace the current transaction and payment techniques due to its improved features such as mobility and better user experience. Mobile POS allows sales and service industries to conduct financial transactions at customer location, improving customer experience and freeing up valuable space for business. Further, mobile POS terminals have low initial cost as compared to traditional fixed POS terminal systems, leading to increasing demand from small and medium sized businesses. Further, hospitality and retail sector are experiencing significant growth in demand for mPOS solutions, driven by improved return on investment and increased demand for customer analytics features. The research report on the point-of-sale (POS) terminals market provides detailed analysis of POS systems and helps in understanding the driving forces behind the popularity of these systems across various end-use industries. It also provides an analysis of major sub-segments of the POS market for the years 2016 to 2026. The report includes extensive analysis of the industry drivers, restraints, opportunities, and market trends. The study provides comprehensive assessment of stakeholder strategies and imperatives for succeeding in the business. This research study focuses on market data and insights, including the market value and volume, and growth trends of the POS terminals market. The report provides a thorough analysis of the emerging industry trends and the prevailing state of the market. It offers a comprehensive coverage of the underlying technological and economic factors influencing the POS terminals business. The prevalent competition in the market is identified through market share analysis of key players. Furthermore, the value chain analysis and Porter’s Five Forces analysis are included in the report, aiming to provide strategic insight across the supply chain of the POS terminals market. Additionally, the report includes profiles of major market participants for better understanding of their contributions. The company profiles include overview of company, revenue, strategies followed by them for gaining competitive advantage, and recent developments. The report segregates the market based on type, components, industry, and geography. The POS terminals market has been categorized into two types namely, fixed POS terminals, and wireless and mobile POS terminals. Components in the POS terminals market have been categorized into hardware, software, and services. The software segment is further cross segmented into on premise and cloud. The service segment is also categorized as integration, implementation, and consulting services. The study offers a complete understanding of different application sectors of POS terminals. The report includes various applications of POS terminals across industries such as restaurants, hospitality, healthcare, retail, warehouse / distribution, entertainment and others. 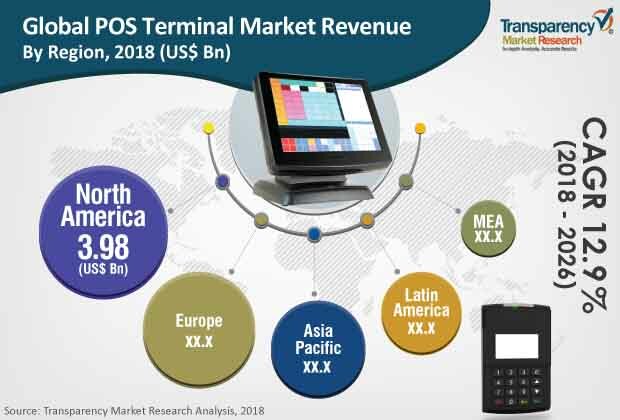 The report aims to provide a comprehensive analysis of the POS terminals market in terms of component, type, and industry across North America, Europe, Asia Pacific, MEA, and South America. Key players in the market have been profiled in the report along with their business strategies and market positions. Companies profiled in this report include Ingenico S.A., NEC Corporation, PAX Technology Limited, MICROS Systems Inc., VeriFone Systems Inc., Cisco Systems Inc., Hewlett-Packard Company, Toshiba Corporation, Panasonic Corporation, and Samsung Electronics Co. Ltd..